I will not let curling irons or hair straighteners near my hair, nor do I use blowdryers or tease it. Given that those are ingredients in pretty much every single hair tutorial out there, what do I actually do when I style my hair? Here are a few very quick (none of these takes me longer than five minutes), extremely easy, and retro friendly hairstyles that use very few tools. All of these styles can be done with or without hair accessories like bows and flowers. Tools: hair brush or comb, hair ties, bobby pins, and accessories. I’m going to assume you know what a high pony tail looks like. It’s the quickest of all hairstyles (except just brushing your hair), timeless and elegant, practical, and stylish. You might want to experiment slightly with placement to see what works best with your face shape and the shape of your scalp. Accessories: It’s very easy to add accessories to a high pony tail, you just literally add them on top. Works with bows and flowers alike. The bigger the bow you use, the more girly you’ll look, so be careful about adding something so extravagant as the one on the left here if you don’t want to risk looking like a school girl. The picture on the right shows a hair comb with two red roses attached to it, but you can just as easily use typical hair flowers. As few or as many as you like. 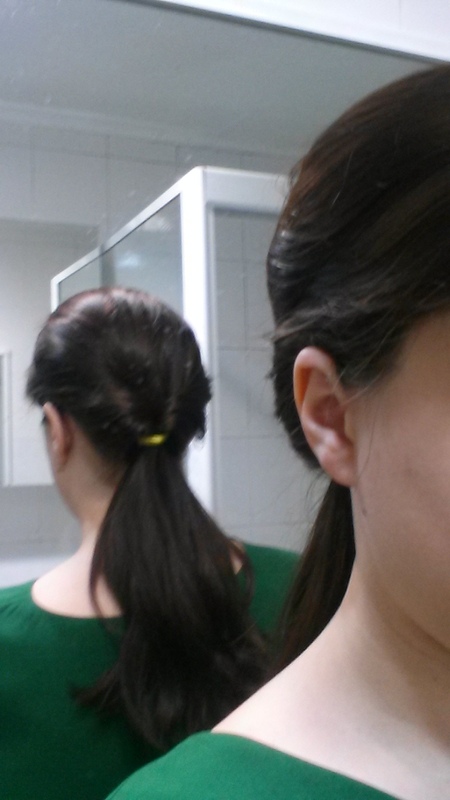 Version 1 – Do the pony tail from Style 1. 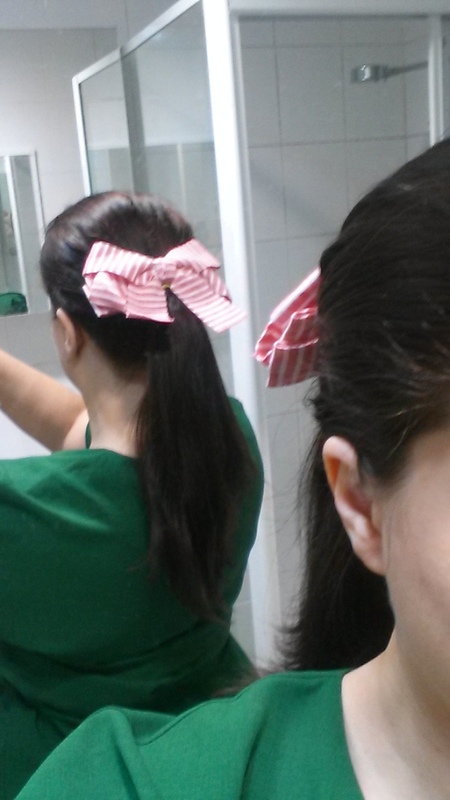 Then fold the tail in and up, attach with bobby pins until it feels secure. 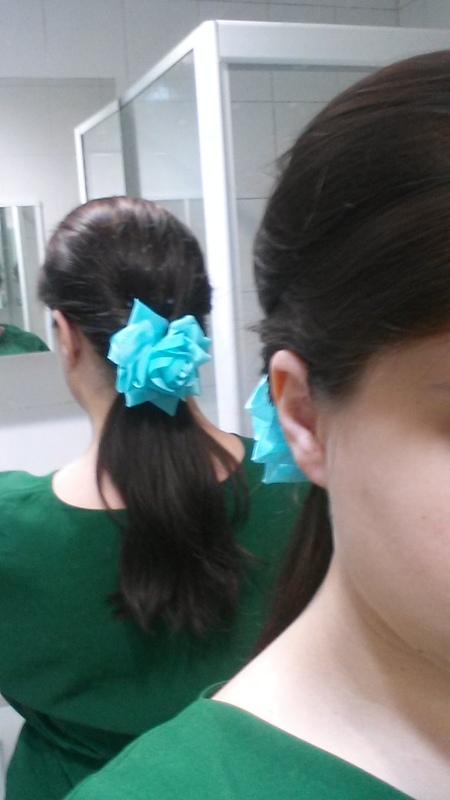 Works best with a pair of hair flowers rather than any bows in my opinion. For this photo I cheated and didn’t actually attach it. When I do this style, I usually do the pony tail. Twist the tail until it naturally starts to curl up into a bun, twist it all the way in, tuck in the ends. Add a second hair tie and attach any stray sections with bobby pins. This is a good way of doing it if your hair is very long or heavy. You might want to consider using hairspray for this one. Once you’ve done it a few times, it becomes a very quick style to do but it does require a bit of practice. Do a mid to low pony tail. Pull the hair tie down a bit. Above the hair tie, part the hair in the middle so that it looks like the eye of a needle. Take the pony tail and going up and in, thread it through the needle. Pull it through all the way so that your hair falls into a natural twist. This style can be worn as is and is a nice simple variation of a pony tail that won’t even take you an extra minute in the morning. It works for casual events but I also think it is romantic enough to work for a date night or similar event. Accessories: Flowers. Definitely flowers. As shown in the photo to the right, I attached this blue flower to the hair tie itself rather than securing it in my actual hair. 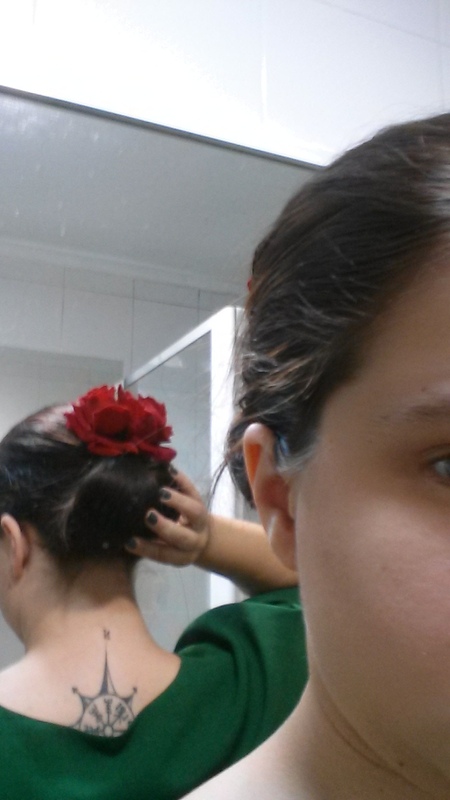 Due to the elasticity of the hair tie, I find that the flower tends to stay in place better this way. It is also less damaging to your hair. 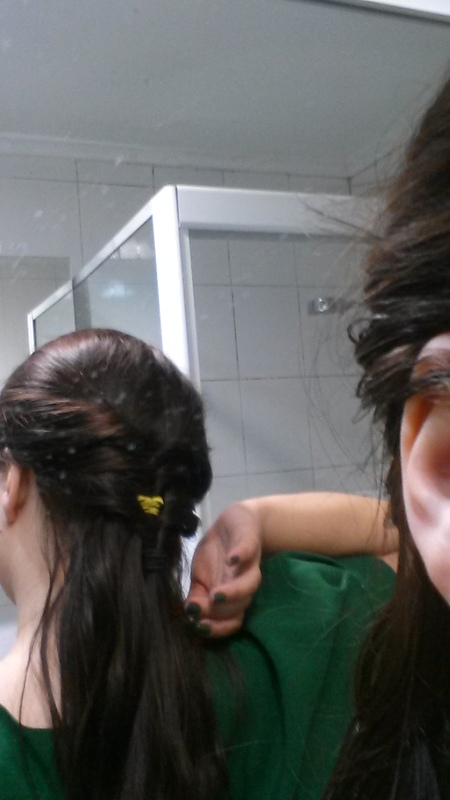 I couldn’t do anything beyond a regular braid on myself if my life so depended on it. That doesn’t stop me from trying to replicate the look though. Brush hair. Take the top section and pull that into a loose but high pony tai. Do the needle part from Style 3. Take a section of hair on each side just below the first section. Do the pony tail and the needle part again. Do the same thing with a third section. I’d recommend doing 3-5 sections depending on what you wish to achieve with the look. Adjust the sections of hair so that the hair ties are not visible. Accessories: If you use thin hair ties that are a colour similar to your hair, you can wear this style as it is. 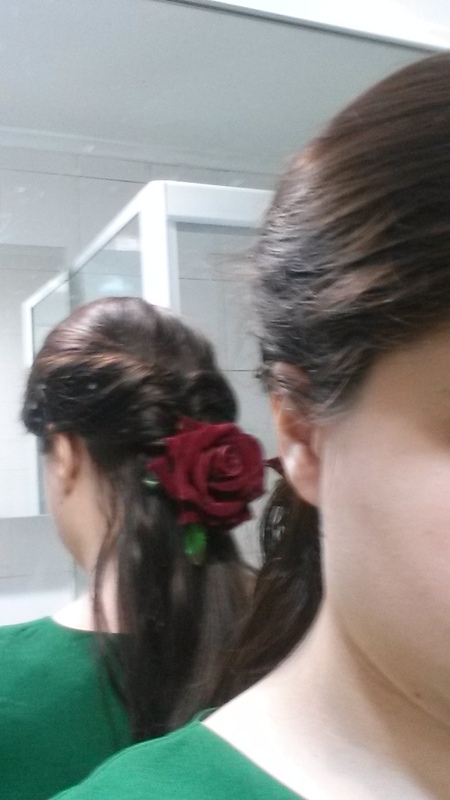 However, I think it looks really nice with a simple hair flower. Because I’m not entirely certain how well this can be seen in the photos, here’s a third picture of this specific style. This is the style that takes the longest to do, but even then I clocked it at about five minutes. As is evident from all these photos, I did these styles in quick succession without brushing my hair in between. Thus it’s obvious that they’re not perfect, but if you spend a little time cleaning up the messy bits like stray hairs or wonky braids, they’ll look a lot better.